And This Mystery Explore is a smoky brown base with loads of copper, orange, and holo microglitter (and tons of sparkle). This is pretty much autumn in a bottle! I've spoken about my love of Edgar Allen Poe, and this all of these are inspired by The Raven. The formula was slightly thicker (in a good way), but fully covered in 2 coats. It dried with texture so make sure to use a thick topcoat, or 2 coats of a thinner one. Also, the microglitter makes removal tough, so get out that foil or peel-off basecoat. Soul Within Me Burning is another polish inspired by The Raven (I think I need to re-read that one). It's a warm-toned purple linear holo with copper shimmer and flakes. The holo shift is extremely strong with this one. The formula was perfect in just 2 coats, and it dried quickly. You should have no issues removing this one, either. What a beauty! 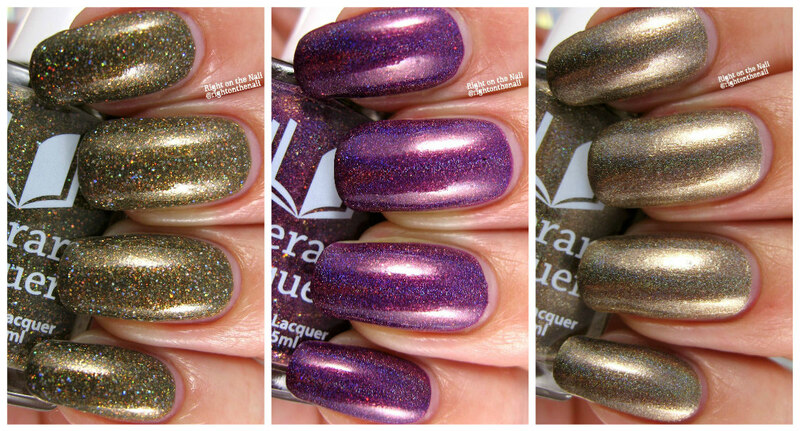 And lastly we have Sweet Lenore which is a sandy bronze metallic linear holo. Whew, that was a mouthful. Some metallic polishes have brushstrokes, but there were none with this one. Indoors this will look like just a metallic, but outdoors, the sparkle comes out to play. Swatches above show just 2 coats, and the formula was once again perfection. Removal was a snap, but double check that you got every last metallic fleck because those tend to stick around (or is it just me?). There you have it, folks! And This Mystery Explore is $10, while the other 2 are $12 each. I love the inspiration here, and Amy does such a wonderful job bringing these stories to life. To learn more about Literary Lacquers, check out their website, Facebook Group, Facebook page, and Instagram.